Students from East Coast Media had a chance to be involved with the BBC Britain In A Day project recently. The project’s aim was to capture people’s lives in one day – November 12th 2011 – and for them to post their films to the BBC where they are being collated into a documentary and archived. Film Director Ridley Scott and director Morgan Matthews invited everyone in the UK to submit a reflection of their lives on that day. Our degree students were invited to look at 10 films each and check them for compliance against the BBC guidelines. The films were checked for language, copyright issues regarding music, branding, advertising to ensure they were suitable for inclusion and broadcast. From there they then had to decide which films would be archived and which would join the playlist and then this was whittled down to 10. It was a difficult choice – there were some excellent films and sadly not all of them made it to our final 10. The students analysed the films and there were deep discussion taking place. Most films were chosen because it’s felt they truly reflected live in 21st century Britain from people washing their clothes to taking a shower to deciding what outfits to wear. Others included tours of where they lived or snapshots of home or family life. It was riveting to sit and take a peek into their lives knowing they were all shot on the same day. It truly is a big undertaking but what a great project to have been involved in. Sadly I never got chance to make a film to submit on that day. Look out for the documentary Britain In A Day and visit the YouTube archive. There are spaces left on the BA Multi-Platform Journalism programme for those going through UCAS clearing . 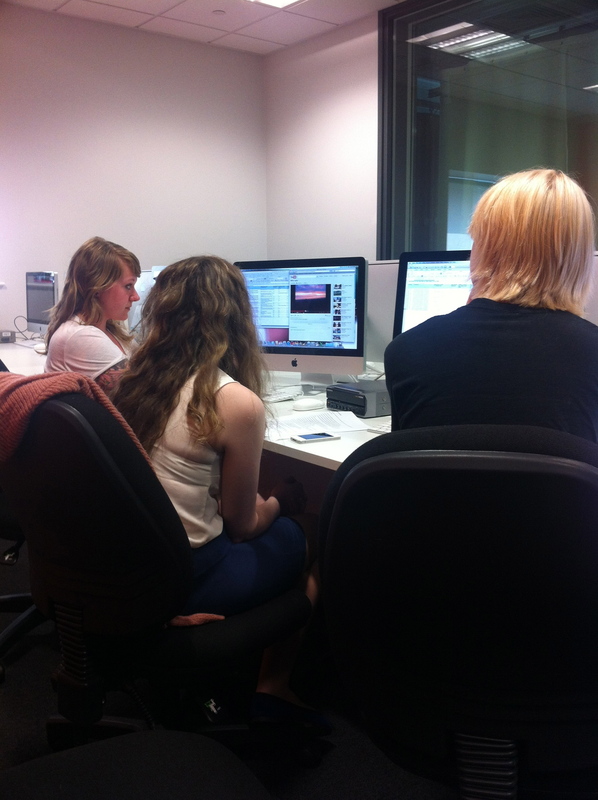 East Coast Media, based at the Grimsby Institute, is one of 23 Skillset Media Academies in the UK. This is a badge of excellence, recognised by industry and government. Look for the Pick the Tick badge. Our BA (Hons) Multi-Platform Journalism has been written with assistance from industry to deliver graduates with the right skills and training. We will want to talk to you to find out why you want to the course and find out if you have the passion and motivation needed. Remember, ask us questions too. We will interview you about why you want to go into journalism. This thorough application process is to ensure you’re suited for the programme – we don’t just give places out to anyone. We need to know that you are right for the course, as much as we’re right for you. It’s all about quality on both parts. If you know someone who is in this position and wants to do journalism then tell them about this blog. Follow @eastcoastmedia on Twitter. To look at some of the work undertaken by the current students, visit their youtube channel or check out the course Facebook page. For further information on the course call 01472 315550 (ECM Reception) or visit the website. Course entry requirements from September 2011 are 240 UCAS points and a drive/passion/enthusiasm for journalism. Grade announcements are fast approaching for many. They’ll be wanting to know whether they got enough points to get them on to the course of their choice? If not, what will happen and what can they can do about it? If you haven’t achieved the grades to match the UCAS points for the course, there are various options you can take, so it’s not the end of the world. There is hope! UCAS clearing is where you need to go. For those unable to get on their first choice, then clearing offers places on courses where there are vacancies. Around 35,000 students every year go through the clearning system. Getting on your first choice is competitive, but if it doesn’t happen, know you still have a chance of getting a place. Once in clearing you’ll need to make a decision about what course you’d like to apply for (are you still looking in the same area?) and where in the country do you want to go (sometimes you’ll have no choice). If it’s journalism then look no further than East Coast Media. Based at the Grimsby Institute, we are one of 23 Skillset Media Academies in the UK. This is a badge of excellence, recognised by industry and government. Look for the Pick the Tick badge. Here we offer BA (Hons) Multi-Platform Journalism. There are very few programmes in the UK offering this. It has been written with assistance from industry to deliver graduates with the right skills and training. I wrote this blog nearly a year ago and thought I would revisit it. As term nears its end for many about to go into their final year at comprehensive, thoughts will start to turn to life beyond and university and degrees. 2012 will be an interesting year for many universities as course fees will have risen dramatically. Here are some top tips if you’re thinking of applying for a journalism programme. I invite all applicants for an interview, as I believe people deserve a chance and it’s a great way to meet them face to face to find out what they’re like and how they respond. Not all, however, get a place on the course and many are rejected for various reasons. For some, it ‘s simply not being able to convey themselves and use English to a high level, for others it’s because they don;t show any interest or passion for the subject. Some can’t even discuss why they like a particular news programme. Most often an answer is “because it’s on”. Journalism is about writing and being able to tell a story in a variety of ways that actually engages an audience. You’d be surprised at how many applications I read that are not well written or constructed. Do these people actually read through their work to check for errors and to ensure it flows and reads well? While I write this blog, I am constantly reading it and re-reading it and changing things. I am never satisfied and take pride in my work. So first tip is to have an idea of what you want to say and construct it so it makes sense. Tip two, check for spelling and grammatical errors. So many applicants use lower case i, instead of I. It’s lazy and sloppy. Don’t lie on your form. Be honest. You should be demonstrating why you deserve a place on a university programme. Journalism degrees are popular. You will be competing against many people. Look at what you have done while at school or college, which makes you stand out. Have you done work experience at a newspaper or radio station? Have you contributed to a school newspaper? Helped produce a community newsletter? Examples like this show your enthusiasm and passion in the subject. Simply saying you’ve always wanted to be a journalist, without being to able to show some determination, in my opinion, is not good enough. It shows you have commitment and a strong interest in the subject and will stand you out amongst thousands. Another important thing, is ensure you have the grades to get you on the programme. There is no point in applying to a course that you will not get on to. I have had applicants send in forms and they clearly have not got enough UCAS points. Also ensure that you have met the entry requirements and if it says GSCE English at Grade C or above, don’t apply if you have it at D or not at all. With me these people get a letter recommending what they need to do. Many never come back, as they were not serious about getting on the course in the first place. Also, if journalism is your subject, then demonstrate you read more than the local newspaper. While the local newspaper is good, demonstrating that you read other papers or magazines shows you take an interest. The same goes for TV and radio. If pressed, could you tell the interviewer why you like one programme or publication above another? Understand what journalism is and find out what a journalist’s role is. So many still come in talking about print journalism. They fail to realise (and this is probably because they’ve never looked) that print journalists use video to produce content for the web. So at least show you have a basic understanding of the career pathway you’re choosing. These are some of the key issues. The next stage is when you get invited in for an interview and assessment. For more information on courses at East Coast Media call 01472 315550. The BA Multi-Platform Journalism programme provides undergraduates with the essential skills required of today’s journalist working in a multi-platform driven newsroom. It provides a mix of theoretical study and practical training and puts them in challenging situations as a way of developing their knowledge and skills base. Throughout their three years, students are taught how to write for different publications and platforms, how to take a good photograph and how to produce radio and TV packages and then translate it into ideas for online. Embedded into this across the three years is the knowledge and understanding of media law, ethics and health and safety. In Year 1, students are introduced to writing and interviewing skills for print based and broadcast media. Alongside this they also learn production skills for broadcast media (radio and TV). They undertake exams in media law and politics and learn about global media markets and how to develop story ideas and be creative across the platforms. Going into Year 2, they are introduced to the multi-platform newsroom, which sees them working for a year producing news content for the Grimsby Telegraph and local cable station, Seven TV broadcasting on VirginMedia 879 and the internet. They learn digital photography skills and the role of photo-journalism to tell a story. Online skills are further developed by producing regular content for a website and they learn more about the media and the role it plays in reporting global conflicts. To develop their print based skills they undertake production of a magazine and develop advanced writing skills. It is in their second and third year, that students are encouraged to undertake work placements either in newspapers, TV, or radio. This helps in their final year as part of their professional practice, which sees them develop their networking and interview skills and gives them help and support to enter the market as a freelancer. The third year also sees students work on a final project, which is geared towards their specialism, but incorporates multi-platform elements. They also undertake the writing of a dissertation, which does not have to be linked to their final project. As part of student learning, students will attend events outside of the timetable to develop their journalistic skills, ie covering music concerts or theatre productions to develop review writing skills; covering a variety of events to develop live tweeting and blogging skills; tasting food to develop food review writing skills, etc. All of this will encompass the multi-platform elements from writing to taking photographs, producing video or radio packages (podcasts) to using and sharing it on social media. In addition to this the students have access to a radio studio and the intention is to have a radio station to broadcast across campus, thus developing their radio production skills. There is also a soft TV news studio for producing daily news bulletins for broadcast on Seven TV and the internet. The 2011 Exit Velocity event was very interesting and informative. Organised by the Faculty of Social Sciences at the University of Hull, it sees the collaborative partners come together for the day. Partners from East Coast Media, East Coast School of Art and Design, Doncaster College, Yorkshire Coast College came to listen to keynote speaker, Prof Susan Orr and representatives from each of the partners. The theme was research, to give inspiration to others as to what to do as a lecturer to develop oneself. Professor Susan Orr from York St John University gave a talk on assessment in art and design. This was a very interesting talk. How to assess work and not allow one’s own views and feelings to enter in to the discussion. Or do we? Should we, even? She talked about learning outcomes and how the assessment process was about looking holistically. She talked about how tutors will have group discussions about pieces, highly trained experts who will make a subjective decision. When practice and codes and rules tell you to be objective. Orr talked about the wow factor, something talked about by J Gordon. The wow factor, according to Gordon, includes “creativity, originality, inventiveness, inspiration, ingenuity, freshness and vision”. Orr also spoke about knowing the student being central to assessment and how if there were disagreements overs grades, they would defer to the lecturer who knew the student. Yet, as she points out, anonymous marking is encouraged so as to avoid this and relating the student to the work. Hard to do in small groups and when the tutor knows the piece of work well. Even harder to do in journalism when it comes to radio and video projects. The research carried out by Orr can be found in a magazine called Networks (Issue 10, Summer 2010) published by The Higher Education Academy. It’s worth a read. “The Grimsby Telegraph entered into a ground-breaking partnership with the Grimsby Institute last year – believed to be the first in the country to give media students long-term hands-on experiences of working in a busy newsroom. Since then, the benefits have worked both ways. We at the Telegraph have benefited from having a team of keen young people, eager to represent the company – effectively doubling our staff. It has meant we’ve been able to attend some events we would normally have to scrap. It is also great to be in a position to offer such experience – I certainly could have done with it while I was still in education. It gives you an honest, no-holds-barred introduction to working in a newsroom – and prepares you for the reality of being a regional journalist. We have seen the students develop – they are certainly braver and less shy than they were initially, and they have produced some interesting features for the Telegraph and our website which, I hope, they have enjoyed. Lucy Wood, news editor, Grimsby Telegraph.